I envy writers under thirty. Not for their youth, but because they have never known a publishing world where indie publishing wasn’t a viable alternative. But I’ve heard even some younger writers make comments that indicate they think indie is what you do if you can’t get a traditional publishing contract. In other words, it’s a second choice. Actually, for some of us, it was a first choice. For the newbie authors out there (or those considering jumping the fence), I will try to spell out the differences between the two paths. Also, I want to mention the pros of each for readers, the most important people in this whole arena! I will try to be balanced, but I’ll warn you all up front, I am biased toward the indie path, since that’s the one I chose. To help counter that bias I’ll let trad publishing go first. And I’m trying to stay positive by focusing on the “pros” of each (the cons are mostly implied). K.B. 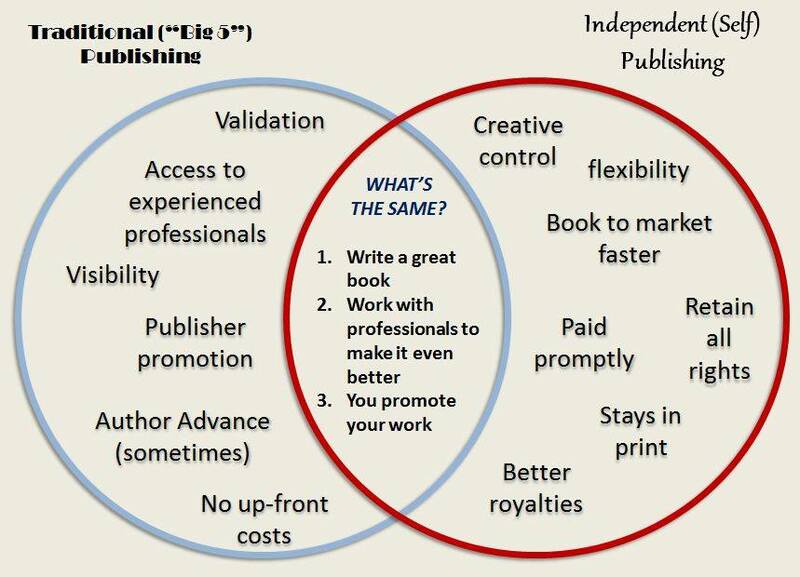 Owen, one of my sister authors here at misterio press, generously offered the graphic she developed for a presentation on publishing she gave recently. It gives us a great jumping off point. Validation: The author can feel confident that their story idea is worthy and that their writing is good. Trad publishing gives it the stamp of approval of the industry. For the reader, this means the odds are good that you will enjoy reading this book, that it will abide by the expectations for its genre and will only have the good kind of twists and turns, not the kind that leave you thinking “Huh?” or have you dangling off the edge of an unexpected cliffhanger. Access to Experienced Professionals: You don’t have to find your own cover artist, editor or proofreader. The publisher provides all that. They prep your book for publication while you are writing the next one. Visibility/Publisher Promo: Visibility is probably the traditional publishers’ greatest “pro.” They have the ins with the retailers, the distribution networks, etc. that make it easier for readers to find a new author. They especially have an advantage in the distribution arena, as indies have to struggle to get their books into physical bookstores. They fall a good bit short, however, in the promotions area (more on this in a minute). Readers don’t have to go searching for new releases in bookstores or hope that their spam filters don’t keep them from seeing their favorite authors’ newsletters announcing said releases. 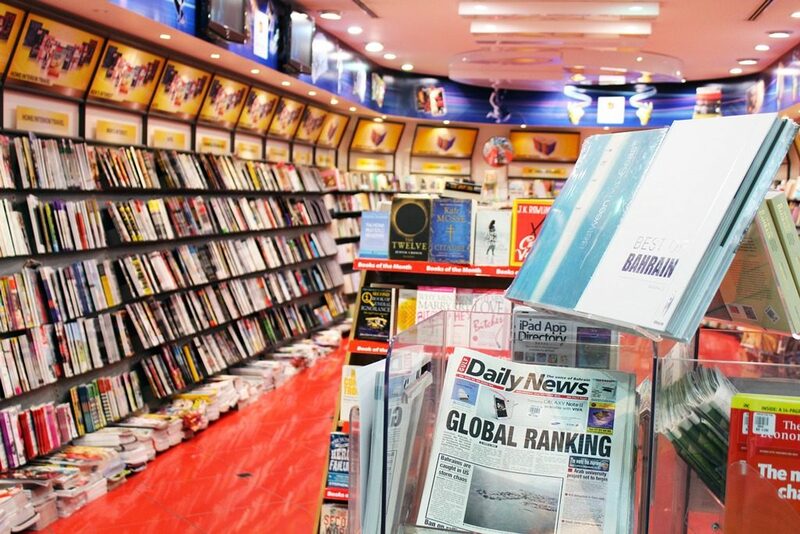 Traditionally published new releases are more likely to be on the front displays in brick-and-mortar stores and front and center in the promos by online retailers. No Upfront Costs/Author Advance: The publisher shells out for cover art and editing. The author pays nothing, and may even get paid upfront via an advance (although these are not as sure a thing as they once were, and are usually small for new authors). This means readers usually see well-designed covers and good editing. Creative Control/Flexibility: This is one of the big advantages for indie publishing. You may have to find your own editors and pay them, but if you don’t like the changes they advise, you don’t have to accept them. Likewise, you find and pay your cover artist but don’t have to live with a cover you don’t like. Related to this is flexibility. The writer doesn’t have to beg the publisher to correct typos that readers have pointed out. You can go in and upload a corrected text file yourself. (But you have to do this; not some worker at the publishing house.) You also control where the book is sold, how much it’s sold for, whether or not it is discounted, etc. And you can change things up to discover what works best for your books. For the reader, this means more innovation—new ideas, new writing styles, etc. Writers aren’t producing what their publishers and editors want; they’re producing what they think you the reader wants. And you let them know if they’re right via your reviews. But it can also mean crappy books with poor or no editing. More books means more visibility, more readers, more royalties. For readers, you’re getting books based on this year’s trends, not those of two years ago. And your favorite indie authors are probably releasing new stories more often. Paid Promptly/Better Royalties: This is the other biggie for indie publishing. Traditional publishing royalties often lag behind by six months or more, and royalty reports may be sketchy or hard to decipher, so you’re never quite sure if you’re getting all that is due you. Indies get paid within a month or two, depending on the distributor, and they get to keep all of the royalties less what the distributors keep. This is between 35% and 70% depending on the distributor and the price point, versus 17-25% (more often 17 and one has to pay their agent out of that) for trad-published books. Readers, indie-pubbed books are almost always cheaper. At 65-70% royalty from distributors for ebooks, these authors can make more money even at lower prices (and most of them would rather sell more books for less each). Retain All Rights/Stays In Print: Yes, trad publishers can provide greater visibility for the new author, but if that book doesn’t sell up to their expectations within six months, it’s almost always taken off the shelves. And then the author may have to fight to get the rights back to their own work. Indies have to work harder and often have to wait longer to get some traction, but their work is available forever, and they retain the rights. Both indie and trad-published authors have to write great books in order to be successful. And they need to work with experienced professionals (cover designers, editors, etc.) to make sure their books are truly the best they can be. AND they both have to do the bulk of their own promotions. Unless you are already a well-established, well-known entity, publishers will spend little to none of their marketing budgets on you and your book. You have to establish a “brand” and develop a social media presence, buy ads, etc. Whatever path a writer chooses in order to get their books out there, judging or sniping at each other is uncalled for. We are not competitors. 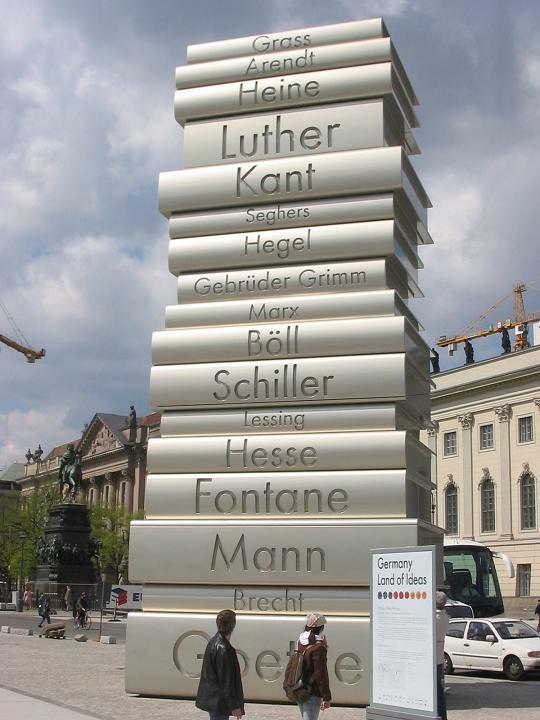 Books are not like toasters or refrigerators. Consumers don’t just buy one every few years. Books are consumable items for readers. The main challenge is getting their attention in the crowded market today. Granted, that market has been made much more crowded because of indie publishing. But putting down other authors doesn’t make your books rise to the top. Only great writing, hard work, and a good bit of luck will do that. 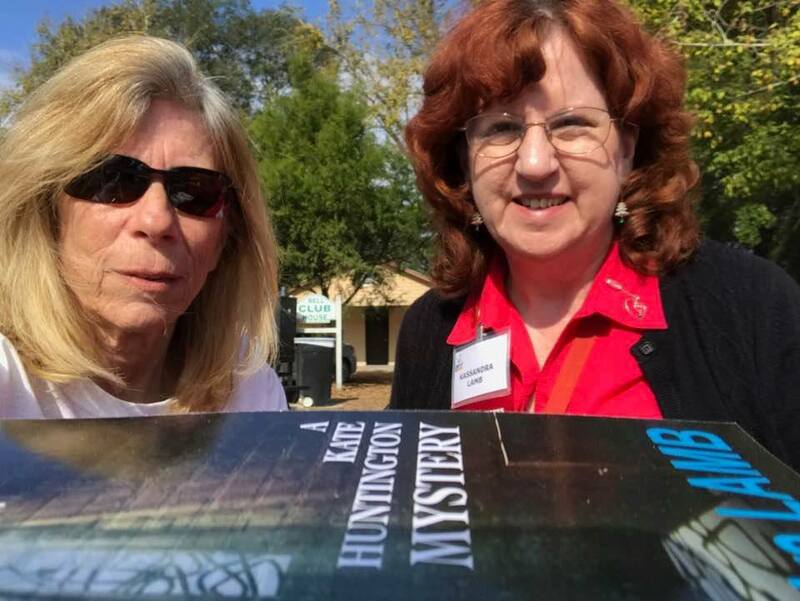 A selfie with an author I now call a friend, Dawn Kopman Whidden, at Bell, Florida’s Christmas Festival. Most folks who stopped at our table bought a book from each of us, because books are not toasters! I much prefer the attitude I’ve encountered in most authors, a more comrade-in-arms approach. Because we’re all in this crazy business together! Your thoughts on this, authors? Readers, do you care whether a book is traditionally or indie published? This entry was posted in On Writing and tagged K.B. Owen, Kassandra Lamb, misterio press, mystery novels, mystery series, publishing industry, traditional vs. indie publishing on January 24, 2017 by Kassandra Lamb. Sure! 🙂 Glad you liked what I did with your great chart. I’ve read that many retail outlets only give a new author’s book shelf space for 2 to 3 weeks, and if their initial order hasn’t sold out by then, they return whatever’s left, and that’s that. The books disappear into a warehouse or some overstock type outlet, and that new author’s chance at discovery has just plummeted. I have nothing bad to say about anyone who chooses the trad publishing route, as I agree with you that an author has to do what they think is right for them, and everyone’s circumstance is different. But for myself, I know indie publishing was the right decision, and I’m glad I chose that route. Thanks for such a great post, and for sharing it on The Write Stuff, as well. You’re welcome, Marcia. Thanks for letting me share it. I too am very glad I chose the indie route, for a lot of the same reasons. I have two books out. The first, a novel, was self published via a great firm, Friesen Press. The second, a collection of humorous essays was picked up by a small publisher, Silver Bow Publishing. I am clearly flexible and see the beauties and the beasties of both. Great essay. Thank you. Thanks, Bill. Glad you could stop by. And best of luck with both books!! I know more and more authors who are hybrids with books in both camps. At this point, the publishing world seems like a melting pot with all kinds of new arrangements such as e-book only contracts. Things are definitely in a state of flux, Vinnie. I think it’s fascinating how many well established traditionally published authors are going over ‘to the dark side’, and taking control of their own careers. They are Indie publishing their out-of-print backlists, books they can get rights reversion on, and books their publishers turned down. One very successful career author, Kristine Kathryn Rusch, blogs at great length about the business side of writing, and runs professional courses on the subject, and all her advice is to go Indie. She has decades of publishing success under her belt, and a huge depth of knowledge on both business and legal matters, and these days she can’t understand why anyone would want to seek soley a traditional deal. Well worth subscribing to her newsletter. I follow Kris’s blog. She has some great advice there. I especially like her posts on what to watch out for in contracts. So many potential pitfalls. If I’m ever offered a traditional contract, it would have to be lucrative enough to justify the lawyer I would hire to make sure the contract was in my best interests and not just the publisher’s! And that “stays in print forever” aspect of being indie can make a huge difference in long term profits. No wonder so many trad-published authors are going indie with their back lists. I have to say, the contract for my traditionally published non-fiction is so straightforward and unambiguous I didn’t feel the need to get it looked over, although if I’d cared to join the UK Society of Authors, their legal bods will take a look for you. On the other side, those contracts are 10 and 8 years old, and a lot has changed in that time. I’m facing the situation now that my first book’s print run is all but sold out, and my publisher has been sold on twice. I have NO idea if there is any likelihood of a reprint, (on my to-do list to find out), or how easy it will be to get my rights reverted if they choose not to. I wish Kris had been doing her blogging on contracts 10 years ago! A straight-forward contract. Now there’s a concept!! 😉 Seriously, I can definitely see the benefit of traditional publishing with non-fiction. That’s where their distributing abilities would be really valuable. Sometimes you can’t wait for a non-fiction book to slowly gain traction. The info in it can become outdated in the meantime. I hope it doesn’t turn out to be a big mess trying to get your reprint done. Best of luck with it! Glad you liked it, Tess. Thanks for stopping by! Thank you so much for this entry. Very clear and informative. May I have permission to use the graphic in a presentation on this very topic (trad vs. self)? Hi, Kenzie. Glad you liked the post. As for the graphic, let me ask K.B. Owen about that, since it’s hers. Glad you liked it, Joynell. Yes, that stigma was hard to overcome in my own mind as well. But once I got past that, others putting it down hasn’t bothered me quite as much. I just shake my head and figure they’ll catch up with reality eventually. Thanks! I’m definitely happy with my choice, but I can see how some writers might want to go the traditional path.